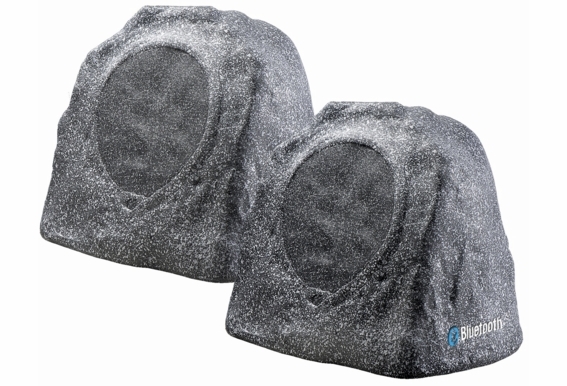 This is the 2nd generation of our Bluetooth® Rock Speakers, we made the following changes a) Using better sound rock shell from our most popular rock speaker RX805 with better bass and clear high ends. 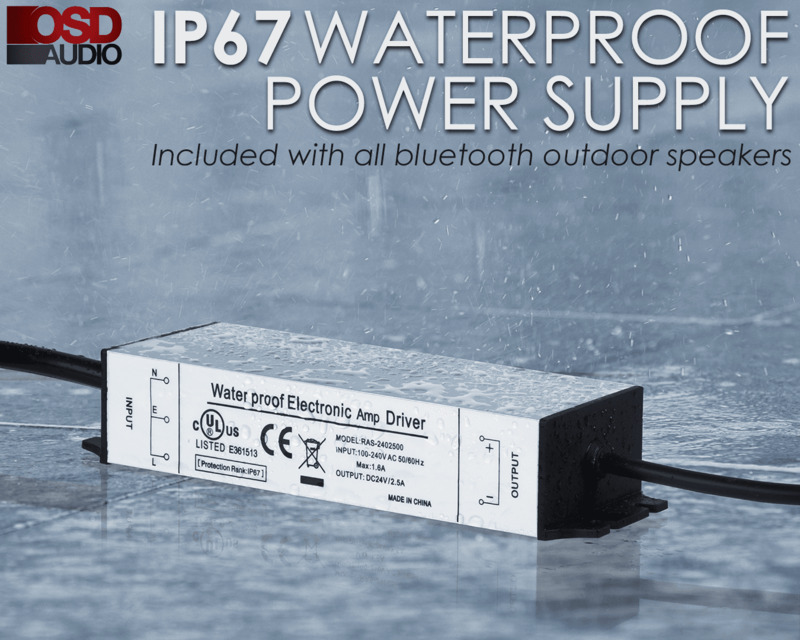 b) Using waterproof IP67 grade power supply for better outdoor durability. 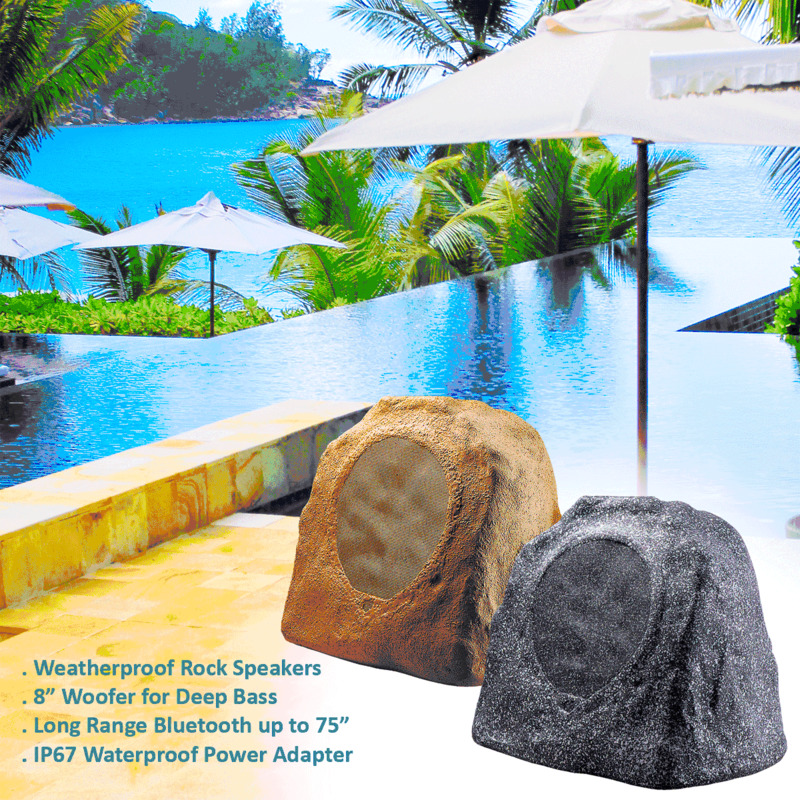 Get ready to jam in any outdoor space with the BTR805 Wireless Bluetooth® Rock Speaker . 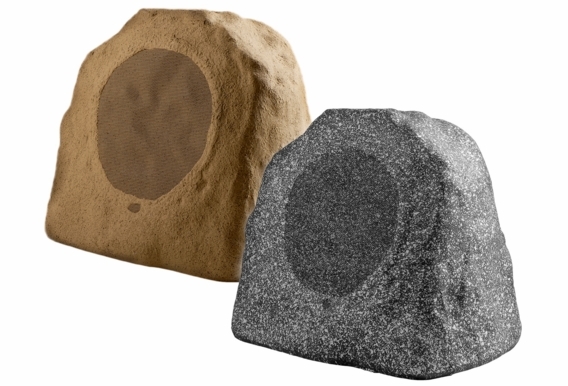 This 8" set is ideal for your lawn, garden or patio for best bass; they come in Granite Grey or Sandstone Canyon Brown so you can coordinate without the speakers looking out of place. There are two speakers, a master and pairing speaker. The master speaker has the internal stereo amplifier plus built in Wireless Bluetooth® Receiver. The second or pairing speaker is connected to the master speaker using the 10Ft speaker cable that is included with the kit. The result is a two channel stereo output. It is recommended to have the speakers 8 to 12 feet apart for best stereo dispersion. You can cut the 10Ft cable down to the exact length desired. The extra cable is supplied in case you have to be created to hide the wire when running it between the two speakers. 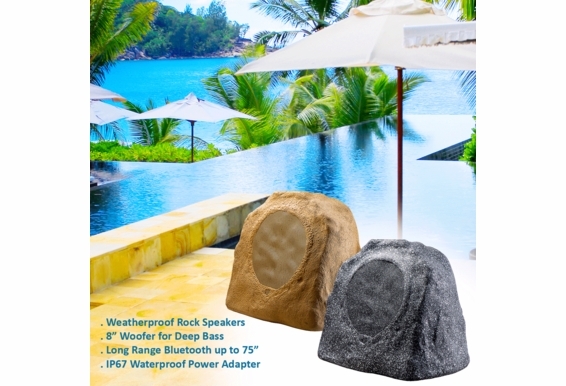 Dimensions: 12" x 11.5" x 14"
1) The Master Bluetooth® Rock Speaker should be located near a 110 volt AC outlet so the Power Supply can be connected to the Master Rock Speaker in order to provide the electrical current needed for the Internal Amplifier and Bluetooth® Receiver. Choose a location where the Power Supply block will not be sitting in water. 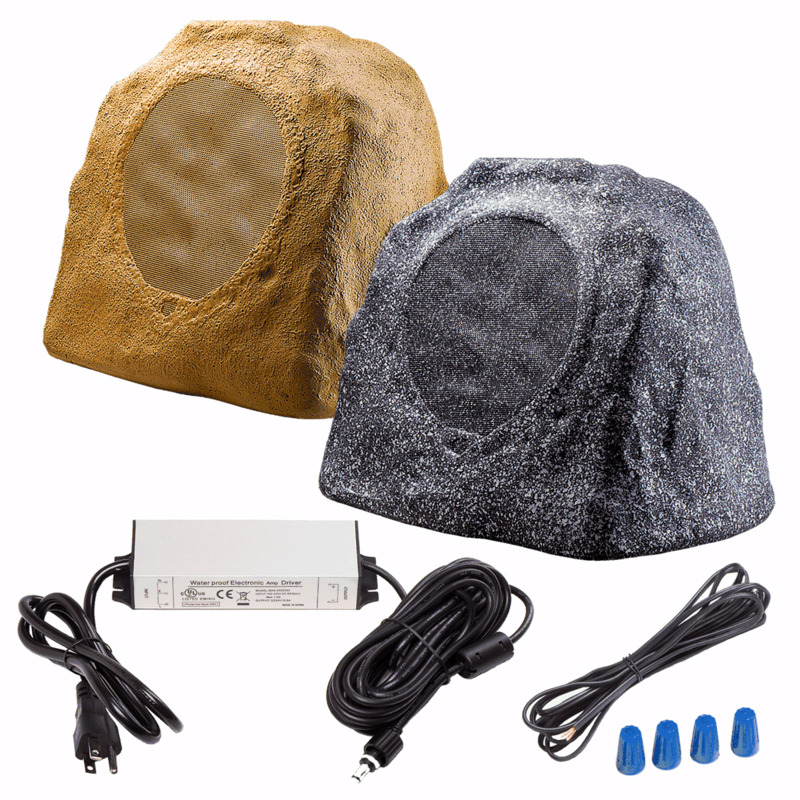 2) The Pairing Rock Speaker must be connected to the Master Rock speaker using the 10-foot Speaker Wire supplied with the kit. Hello I would like to know where i can find a replacement power supply. My speakers worked fine for about 2 hours then stopped working. I tested the power supply on a couple (working) outlets and each time the plug that screws into the speaker was dead. Thank you. Brian Jackson. How long is the power supply cord? I want to make sure they will reach the plug from the shrub bed. I purchased a pair of the BTR805's a year and a half ago and absolutely love them. Unfortunately here in South Texas the sun gets very hot and the Bluetooth range on my speakers is probably 15' at best. Setting my phone out near the speakers is a real pain as I have to hide it under a chair to keep from overheating and stopping. Is there a way to extend the Bluetooth range? The whole idea was to sit at the patio table and eat with music playing but the table is about 25' away and there's no way the current Bluetooth in the system can reach it. 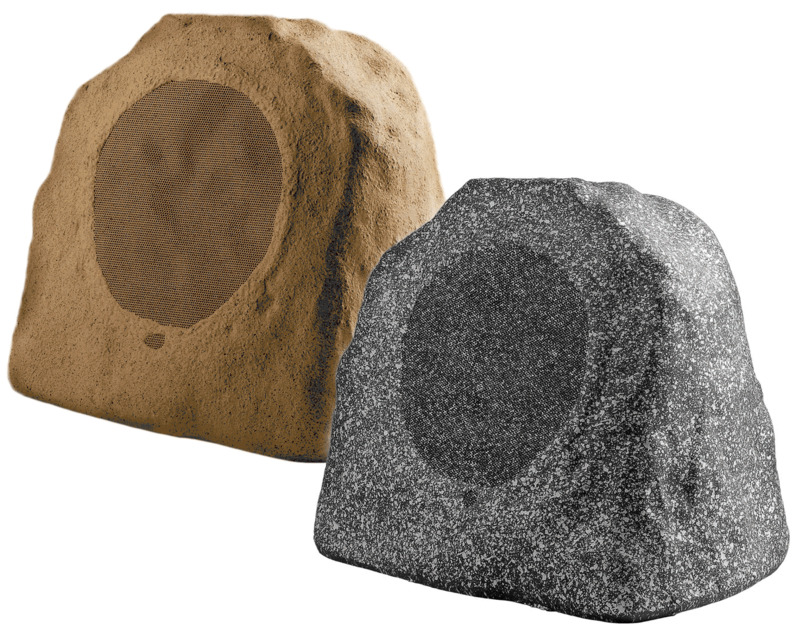 Can rock speakers be left out in rain. I recently started receiving a lot of bluetooth interference (audio cutting out) if I'm holding the broadcasting device (phone/tablet/etc) in my hands or attempt to use the device for anything (change the track, browse social media, etc). I've tried using the device with and without wifi enabled, and I've tried other devices, and still the same. No obstructions, and the device and speaker are sometimes even 10ft apart with this issue. Any ideas? Any update on a solution to adding another set of these speakers to the existing set so you can run 4 versus 2 speakers with Bluetooth. Hello, I bought this product from Amazon a few days ago. The problem I'm having is that the "master" unit has a lot more bass and not enough treble than the "slave" unit. The speakers are about 25' apart and you definitely hear the difference when you are 20 + feet away and if I get close to each one of them, one has a lot better sound than the other! Please let us know if this is a normal occurrence or if we need to return them. I am comparing this set to the BTB650 set that I've purchased two years ago that are working great. Looking forward to your reply. Can this be powered by 220 V AC instead of 110V? I just purchased the BTR800 speakers in granite grey but, I thought I had ordered the brown color and don't like to grey color. Any idea if I could spray paint them brown without causing any damage to the speakers? Does the BTR800 broadcast a 4digit pairing code ...it does not seem to..what is the solution? I have paired the system and have no volume control..there is no code being broadcast by the BTR-800 units What is the 4digit code..I have my phone hooked up to it no problem. The instructions clearly state that the BTR-800 will output a Bluetooth sync code..
can i buy 2 sets and add them to the bluetooth connection? Can someone please let me know how long is the power cord? Thank you! Can an amplifier be added to these speakers to increase sound? Can I hardwire a 3rd or 4th speaker to the system? Can these be linked to play with an already installed Sonos system? Are the rocks wired for Power? So do they have to be close to an outlet? I want to use my Ipod that is not bluetooth enabled. Is there an adapter for my Ipod that I can use to transmit to my BTR-800 rock speakers? I had my iPhone connected to the speakers via bluetooth. Then I replaced my iPhone because of water damage. How can I reconnect to the bluetooth rock speakers. Thank you. 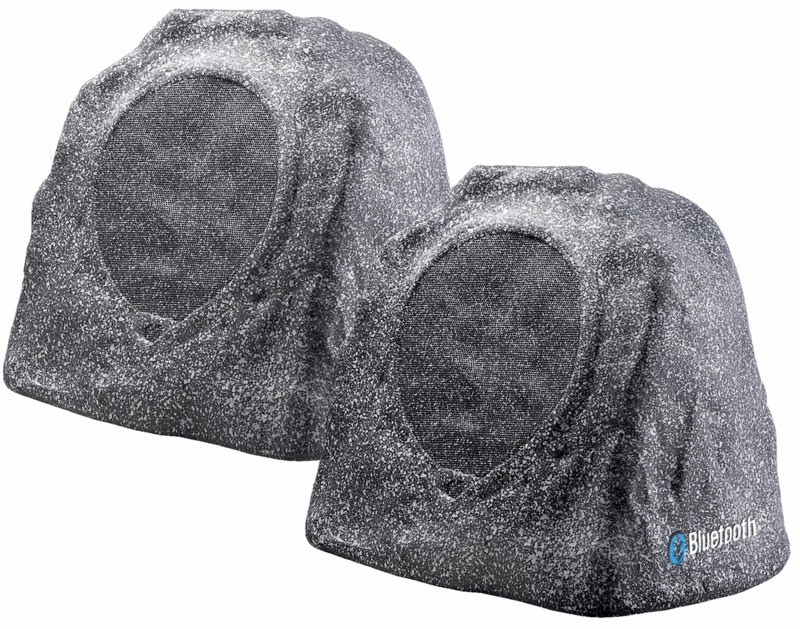 Hi Jan: These are as waterproof as we can make them where we weatherproof with silicon on all the access points and around the frame of the speaker and speaker wire connections. 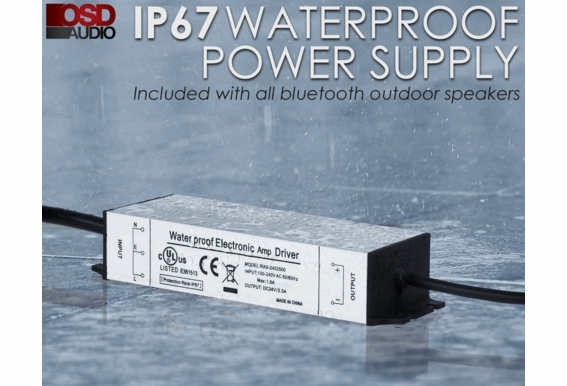 These also feature waterproof on/off switch and Power and speaker wire connections. The weakest link is probably the perforated grill on the front of the rock where the sound comes out. Make sure to stay away from sprinklers, standing water and plan to take them in when not using for extended periods or during the winter months (certainly a short time in LA). Snow won't be a problem for you which is good. Good luck Tim L Note; One of the speakers is the Master which features an internal Bluetooth Receiver and Stereo Amplifier (this has the 20 foot power supply and cord connected to it). It also features a output for the speaker wire that connects to the second or satellite speaker so you can have true stereophonic sound. Speaker placement usually between 8 to 12 feet apart. Do you have a wireless (Bluetooth) speaker that also uses aux to connect to MP3 player? Does the speaker wire have to be buried? Can the power be left turned on the main speaker for long periods of time even when not in use? Are the two speakers hard wired together? Is so, is the wiring rated for underground burial and for the elements? Are these loud enough to host a party where 75+ people are attending in a backyard? do the two speakers need to be connected to each other? I was hoping to put one at the bar and one by the fire pit without needing to connect them to each other. I know they are sold in pairs, however, if you use a y adapter or 2, can you piggyback more speakers. If I bought 1 pair, and 2 additional secondary speakers, could I hook them all together (or would I lack Power) also do you ship to Canada? Hi Alan, I believe you should be able to run two satellite speakers off the main speaker, but only one master speaker can be paired with a Bluetooth device. Is the power cord fully weather proof and weather proof? Also, could it be buried in the dirt if desired? Hi Kevin, It is designed for wet areas, but I wouldn't bury it. Hello, One set per device only. Hi Bryan, You can only connect 1 pair to a device at any given time. That is the limitation of Bluetooth in its current version. I currently have 2 wired speakers outside. 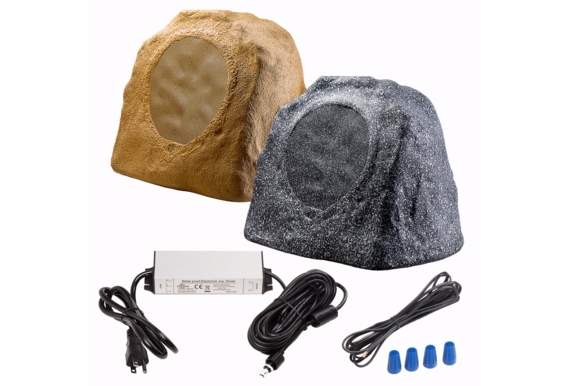 Am I able to add these 2 speakers outside and have them work with the wired speakers? Hi Devlin, These speaker run off Bluetooth via a smart device such as an iPhone, Android, etc. They can't be paired with wired speakers or other wireless speaker for that matter. Great speakers to quickly and easily connect to but they are limited to your Bluetooth smart device. what speakers have more volume or sound, BTR-800 or BTP-650. In description they have the same watts, but subwoofer in the BTR-800 is 8" vs 6.5" ind de BTP-650. Hi Alain, The BTR-800 will give an overall stronger volume with its 8" woofer. The max volume will really depend on the Bluetooth device controlling them though. Do I need to turn off these speaker after every use or do they automatically go into standby mode? Hello John, They will stay powered on but will use very little power/energy if no source is actively playing through them. Is there any way to adjust the "test tone" that comes on when powering these on? The volume is incredibly loud! Hi Heather, Unfortunately no - there's no volume control apart from the volume on your device. I bluetoothed this to my hopper/tv. However, I cannot figure out how to adjust the volume. I can adjust them when connected to my ipad. Hi Cellini, The only volume control you can have with these speakers is if your bluetooth source has volume control. Can I buy a longer speaker wire from you for the master to satellite speaker? My ideal set up would require about 50 - 60 ft of cord. If so, would there be any performance issues and what would the possibly be and why? It would seem that with a longer cord, Would be fine since the speakers would be hardwired. Also, could I use an extension cord to lengthen the distance of the power cord from the master to the outlet without any performance issues? Hi DP, Yes, you can lengthen the wire with extra speaker wire but usually it's not recommended to run two 8" speakers further than 30ft because you can get separation of stereo. That's completely up to you though. Yes, you can run an extension chord to give you more room to work with. Thanks!